Sometimes the best meal is the one you make for yourself. Same thing goes for coffee. A cup of coffee freshly made from a French press is a wonderful thing. However, sometimes you want a little bit more than just a plain cup of coffee. Well, no need to run to the corner coffee shop, you can still make your own. The Bodum Mousse Electric Frother is a simple to use battery-operated device designed to whip up froth and foam for your coffee drinks. 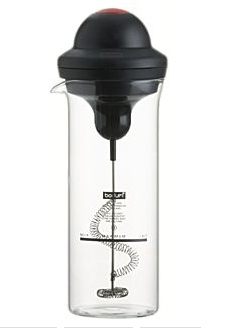 It comes with a microwave-safe borosilicate glass carafe, so no worries about cold milk. Whether you prefer a cappuccino or a latte, your favorite coffee drinks are a whole lot closer with this little frother.